Need this book faster than other websites send it?? Laughing Grape Publishing gets the book out in 24-48 hours after receiving the order. NO delays and books are always in stock! The most passionate and best informed patient revolution has begun! 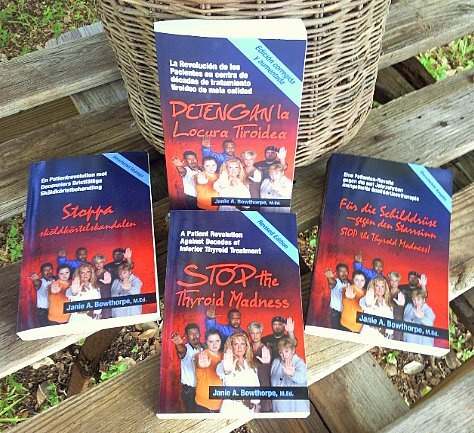 Based on the experience of a large and growing body of patients worldwide along with several wise and caring doctors, this is the patient-to-patient experience book, chock full of practical, comprehensive and user-friendly information about better thyroid treatment, more revealing labwork, and conditions that accompany hypothyroid–all to make you far more educated and pro-active when you enter your doctor’s office. One of the most detailed treatment books you’ll ever read…and read…and read. An exhaustive addendum on how to interpret your saliva cortisol labs by adrenal/hypopituitary patient Bob Harvey. WHAT’S IN THE REVISED SECOND EDITION? We take PAYPAL, but you can also print out the form and include a US Check, US Money Orders or even US Cash (at your own risk). FROM JANIE: When I created this STTM website, it was done to counter lousy advice I was seeing on the internet on certain websites–advice that was keeping patients sick. I thought it was going to help make a huge change towards far better thyroid treatment. And it definitely has. Yet, I kept getting requests for a book version. People wanted something right in their hands to learn from, and to take into their doctor’s office. So, I finally created the STTM book. I made sure that all that you find on this website is in the book, but I also added a great deal more, as mentioned above. And to my great relief, the feedback has been excellent. Below are just some of the comments I’ve gotten, which I hope helps you in deciding if you need the book, as well. You can read even more feedback here. “I love your website but I found your book to be far easier to browse through. Thank you. Thank you. Oh, and I had a good laugh when I looked through your Glossary.” -Michelle R.